En garde! PAX East came to town over the weekend and wow it was a whole lot of fun. I had the chance to try out so many awesome games, among those was one that I frequently returned to– Samurai Shodown (2019). Fighting game huh? You know I had to get down! 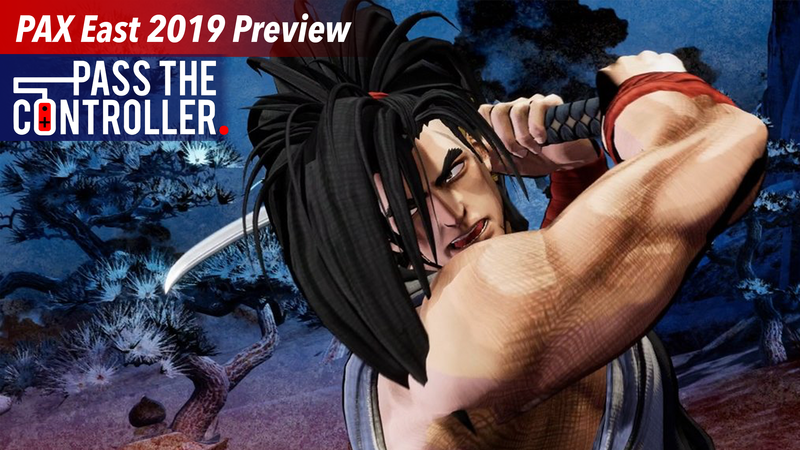 This new iteration of Samurai Shodown was a freshly polished and crisp looking modern take on a classic fighting franchise that hasn’t seen a new game since 2008! Well, 2009 if you count the Samurai Shodown Anthology that came to Wii, PlayStation 2, and PlayStation Portable. But regardless, SNK is bringing the series to the current gen eration of consoles later this year and I couldn’t be more excited to have another fighting game to whet my appetite. It’s been a long time since I first discovered the series back on the Super Nintendo. In my first match, I swiftly moved my cursor down to my girl Charlotte to see how she played in this spiritual reboot into the storied fighting series. She felt great but the match didn’t go as I had hoped. My opponent used Earthquake and your boy (well girl in this case) got absolutely wrecked! I’m trash. Though, even suffering a devastating loss, I was hungry for a rematch until we got hit with a splash screen with Nakoruru thanking us for playing the demo. If you’ve been to a PAX before you’d assume that was your one chance at playing the game because most of the time the lines are crazy long and there’s hundreds of other games, dozens of panels, and more to do with the limited time you have. But the line went very quickly so I hopped right back in line again– felt like the old days of throwing my quarter down on the cabinet when losing in Street Fighter III: Third Strike or Marvel VS. Capcom 2. On my second go around, I calmed my hype down and played around with the mechanics a tad bit before engaging my new opponent. You can’t approach SamSho- that’s what we call it in the FGC (fighting game community)– like other 2D fighters. Button mashing won’t get you far here. Samurai Shodown is a more grounded fighter with a strong insistence on waiting for you enemy to strike and counter them. You’ll benefit from taking your time and reading your foe’s attacks. This strategy makes SamSho stand out from other fighters that you may have played or know of. Another returning characteristic of Samurai Shodown that awards it it’s own unique battle system is the Rage Gauge. You build your Rage meter by receiving blows from your adversary. Saving your Rage for when the chips are down is a popular strategy to score an epic comeback. Movement felt top notch which resulted in smooth feeling footsies. Counters were hype when executed as were clashes! Catching my rivals weapon and flicking it aside like a spent cigarette felt like the equivalent of yelling, “What you gonna do now sucka! ?” Stripping your challenger of their weapon is integral to gaining an advantage in battle because their tactics have to change. When you disarm your opponent, boxing comes to mind because all they can use is their barehands, and we all know what happens when you bring your fists to a sword fight. Aesthetically SamSho is a total work of art. Colors are vibrant, blacks are thick, the blood– and there’s plenty of it– splashes and stays on you when you strike your opponent. Big time attention to detail in the animations and fluidity of movements of your fighter. A good balance of stylized and not too realistic looking. My only gripe besides wanting to play more is the roster size capping out at 14 fighters so far. But hey, its 2019 and we are sort of spoiled– thanks Smash Bros.! As long as the roster is diverse, fighters have their own unique move-sets, and the gameplay feels balanced Samurai Shodown should turn out to be a decent fighter and championed in the FGC. I’m hungry for more! So excited to say Samurai Shodown is back and hopefully here to stay. I’m looking forward to adding this title to my library of fighters when it comes out later this year on Nintendo Switch, Xbox One, PlayStation 4, and Windows. Don’t forget to watch high competitive SamSho later this year at EVO! Ippon! For all things Samurai Shodown and fighting game related be sure to keep it locked to Pass The Controller and my personal twitter for FGC rants! For a deeper dive into all things gaming and nerd culture be sure to listen to the Pass The Controller Podcast with new episodes weekly and join our community Discord to continue the conversation!